New York Yankees' scouting report on No. 1 pick Carl Everett: "It appears by this photo he has no problem playing under the glare of a thousand suns, so the New York media shouldn't be a problem. ... One thing you can count on: no personal controversies. 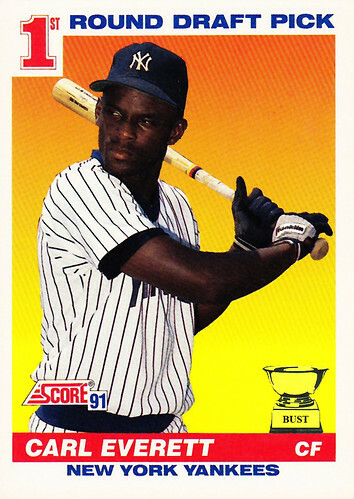 ... Looks good in pinstripes, even pinstripes on a uniform for a pizza parlor-sponsored team. ... We've only seen him in underexposed photos, so we have no idea what he really looks like. ... Has a plus arm, plus bat, plus speed, but minus math comprehension. ... We like his baseball IQ; his real IQ, not so much. ... He has the skills to become an offensive player, and we mean someone whose play is offensive. ... We liked him when we saw him a few months ago, but since then we looked at this card and became blind, so we only have memory to go on."